I came across my first attempt at embroidery the other day, and am now adding the last few stitches to finish it. Just a little more detail on the trunk, and a couple more nuts for the squirrel. Cute, isn’t he? I found the pattern on Flickr, in the Embroidery Group pool. Embroidery is more appealing to me at the moment than knitting and crochet, no thanks to the warmer weather! I’m not sure if I have done the stitches correctly, but I am quite happy with it nonetheless! I’m going glue the edges of the fabric to the back of the hoop and hang it up in the hoop. These first hoops I bought weren’t the best, very hard to tighten. I have some better, plastic ones now. 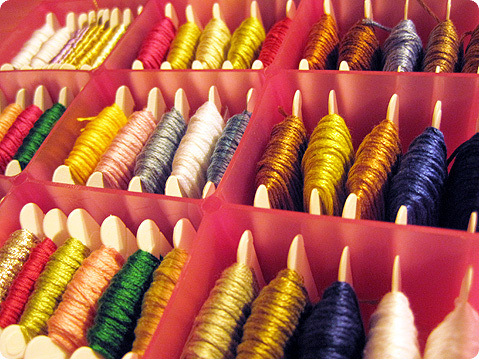 I also enjoyed winding all my threads onto the cards and arranging them in my storage box. I just came across a very lovely site with free vintage embroidery patterns: Vintage Transfer Finds. Do take a look, so many wonderful patterns to be found. Visit Kootoyoo for many more Creative Spaces. 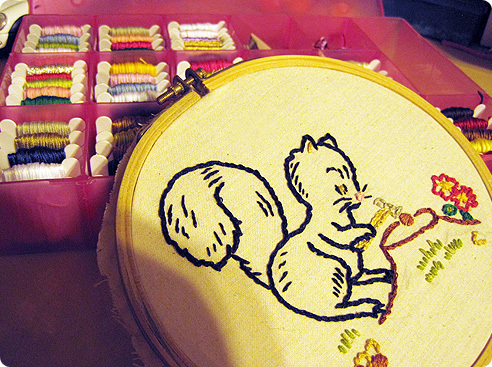 That’s a very cute squirrel :-) Love your box of threads, they look so pretty and organized!